As a Religious Organization with an outreach in Sierra Leone, Nazareth House Apostolate wants you to be familiar with the work and how we do that work. Others may do things differently and we applaud everyone that makes an effort to help those in need. There is so much suffering, it requires everyone to do their part in lending a hand. The following is what we have found works best for NHA and those that we serve. Specifically we want to talk about shipments made overseas from Nazareth House Apostolate. We’ve been working in the war-torn West African Nation of Sierra Leone for well over ten years now. When we began, we had no clue how to help, we only knew there was a need that we refused to ignore. Through the years we’ve had many trial and errors but any disappointments have been far outweighed by the many accomplishments. Every time you help a child to go to bed at night with a few less hunger pains - you’ve made a difference. Every step (backward or forward) has been a learning experience and we are thankful, very thankful for it all. Nazareth House Apostolate is a religious organization. The heart of Nazareth House Apostolate is St. Simeon Skete (prayer) from which all that we do begins, circulates and is pumped out. Our daily prayer rule “The Eleven” is the beating of that heart. Nazareth House Kabala in Sierra Leone (outreach), our field house in which the mission work is accomplished is that prayer being broadcasted into the world. The supporters and the beneficiaries are the food that supports the body enabling it to do its work. Our work in Sierra Leone is all about love. Love as expressed in Matthew 25: 35-40. During the war and soon after, it was necessary to ship as many supplies as possible. There simply wasn’t anything left or available. As the nation slowly began to heal, more and more merchants provided staples and shops began to re-open. 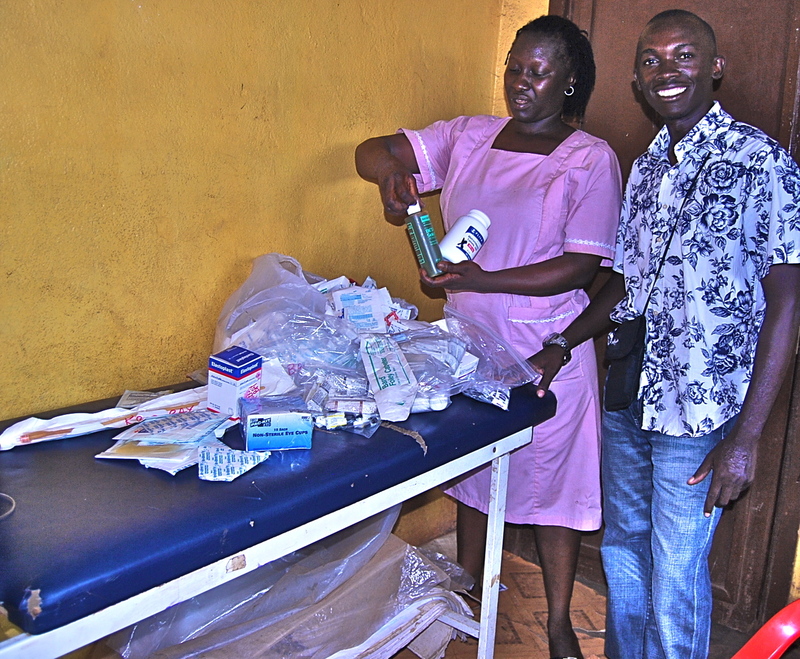 Today, you can find most anything in Freetown with the exception of good (safe) medications. Some items are available at an exaggerated price, however, when you weigh the cost of shipping that item from the States, it remains more prudent to purchase it in country. 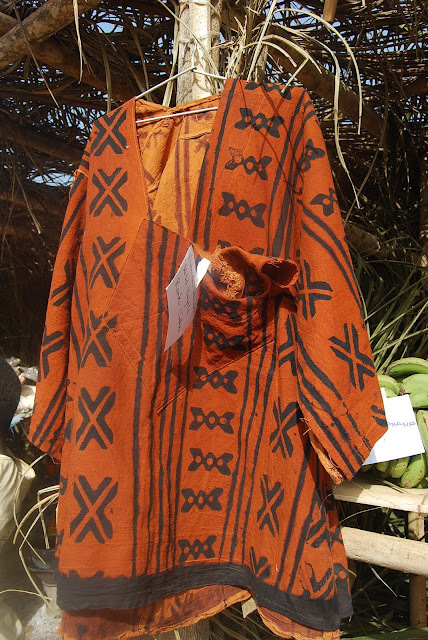 Kabala is known for its cloth and tailoring, and especially for the making of the "ronko" gown - (reference:click here to read wikipedia). It is for this reason that we ship little to no clothing to Sierra Leone. 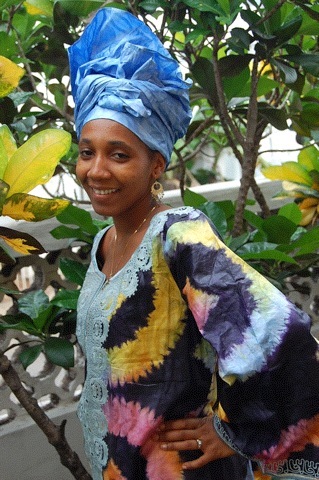 Handmade clothing is available all over Kabala at a good price. Even in Freetown, where prices are generally higher, you can find clothing in shops and on the streets at reasonably fair prices. It is for these reasons that Nazareth House Apostolate prefers not to ship any article except the most needed items to Sierra Leone - namely medications. By purchasing material from a cloth merchant and having a tailor sew the item, we have stimulated the economy; providing a sale for the merchant and income for the tailor. Rather than one child receiving an article of clothing to wear, we have touched three lives in a positive way - 1. the cloth merchant, 2. the tailor, 3. the person who receives the clothing - for much less than the cost of shipping. Nazareth House Apostolate’s goal for a village is to become unneeded. This means that the village or town becomes self-sufficient and no longer requires our assistance. When a village reaches that goal, we can then move on to another. It is important that a town or village is not put into a position of becoming dependent on humanitarian aid. The saying “Give a man a fish; you have fed him for today. Teach a man to fish; and you have fed him for a lifetime”. Our goals are simple in Sierra Leone. 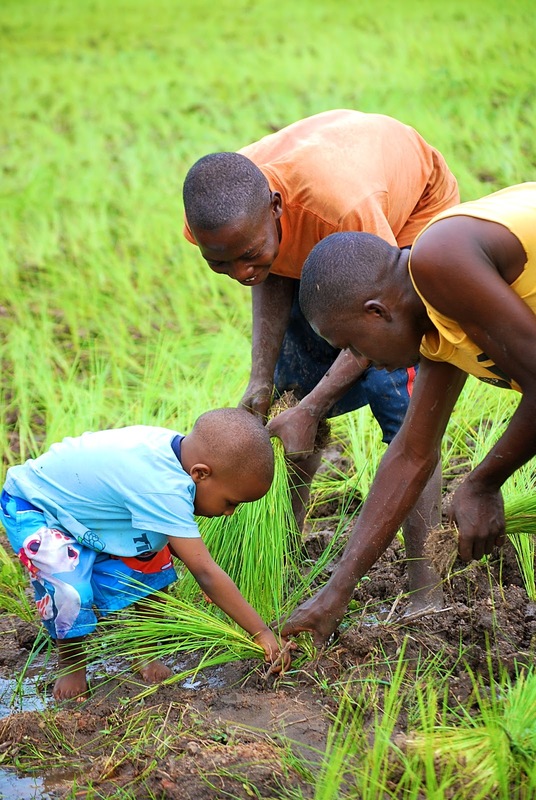 The farm in which Pa Foday labors tirelessly, provides vegetables for several, we want to expand it so that there is food for more...for eating as well as produce for marketing. Education is one of the most important tools for a community's growth. We’ve built a very nice school building, servicing nearly 300 students. It needs expansion to accommodate the ever growing enrollment. We are having to turn students away. This is not good. Communication. There are no landlines in Kabala, only mobile towers. Internet accessibility is limited to the IP’s whims. NHA is working to strike a deal with satellite company to provide satellite capabilities. We are considering an internet cafe ran by a NHA Staff member with the proceeds benefiting the NHA School. Water. We are very excited that we now have a permanent center of operations in Kabala - our NHA Compound. The water in Kabala, however is not very good. Our well at the NHA Compound reached water but it is not able to be pumped into the house. We will need to hire more workers and equipment to finish this project. However, it is more than the NHA Compound that needs a water system rescue. There are many agencies that install and maintain water supplies, we will be speaking with them about the needs in Kabala. While we press on with new projects and more needs we continue to provide humanitarian aid to those in need - rice to sustain families, medical fees for the sick as well as supplies for the clinics, benevolence to sustain, salaries for our teachers, aid to One Hut village as well as outer villages, operating and upkeep of the NHA School --- NHA is very active in Kabala. Plus, there are those we continue to maintain in Freetown. When James makes the monthly supply run to Freetown he sees to it that these people are not forgotten. NHA never drops and runs, we remember and check on the people and villages that we serve. Our monthly expenditure to provide these needs is $2,200. We currently are supported by 31 donors who give monthly ($25 or more), regularly (quarterly and annually). We also receive the one time, random, and gift (in honor or memory) contributions. So far we have been able to make the needs each month. This amazes us as most of the time we barely scrape by and come up with just enough, just in time. Sometimes we are late distributing but we have never failed to provide. The work in Sierra Leone is sustained solely by donations. It is a difficult trip for James to make from Kabala into Freetown and back. We have brought to your attention the need for a vehicle of our own to help curb the dangers of rental car costs and “scares” (unsafe vehicles with unsafe drivers) on treacherous roads. This is another reason we limit the amount of shipping sent to Freetown for James to receive. If boxes come in and our left to sit, there is a good chance the contents will be stolen. Therefore, James must go to Freetown when notified of the arrival of a shipment. We try to time shipments to arrive when he makes his supply run so as not to endanger him any more than he already is by making the trip. It is our hope that this writing clarifies our stand on shipments to Sierra Leone. We encounter tremendous needs in Sierra Leone, yet we ask that people resist the urge to donate items to this cause unless specifically requested and approved. In a nutshell, it’s actually prohibitively expensive to export goods from the United States to Sierra Leone. Rather, cash donations are preferred and greatly appreciated. This approach benefits the local economy (local skills, labor & materials) and assures your tax deductible donation goes directly to support needs and projects and reduces administration costs such as shipping.